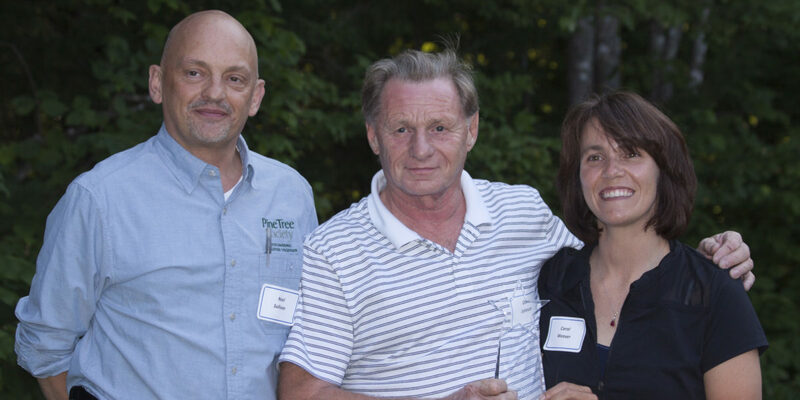 On Wed., July 20, Pine Tree Society honored the 2016 recipients of the Spirit of Pine Tree Society award. The profile below is the story of honoree Dave Johnson, owner of Kennebec Electric in Waterville. Learn more about the other honorees: Priority Learning of South Portland and Marie Preston. That’s how Carol Brunjes Weaver describes Pine Tree Camp. Carol was born with cerebral palsy. David is the owner of Kennebec Electric in Waterville. Thirty years ago he was hired to work on an electrical job at Pine Tree Society’s office in Bath. He had never heard of the organization before and when he asked what they did, he knew camp would be a perfect fit for Carol, but he didn’t think their family could afford to send her. When he learned that no camper had ever been turned away due to their ability to pay, there was nothing that could hold them back from giving it a try and they decided to enroll her. She attended camp for the next 10 years before going to college and becoming a math teacher. When he learned that Pine Tree Society was building two new cabins as part of its Master Plan for Capital Improvements, he jumped at the chance the help out and offered to wire the buildings for free. She and her dad were very close when she was young and they grew apart when she was a teenager. David is very humbled by the Spirit of Pine Tree Award.